The perfect kit for professional and amateur crafters alike, this funky woodies set features 2 x 30mm stamps, 2 x mini stamps and 2 x ink pads. Each stamp is made from beech wood and 100% natural rubber ensuring durability over time. The ink pads aluminium can with screw top will help to keep the ink moist for longer lasting use. Spread the word that it's a baby boy in shabby chic style with the woodies kit. 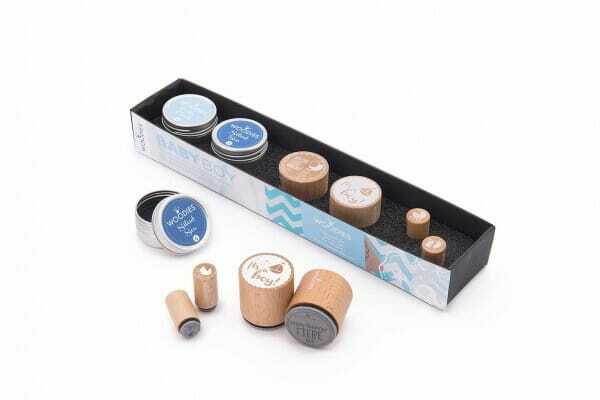 Customer evaluation for "Woodies Kit BABY BOY 2 stamps Woodies, 2 stamps Mini-Woodies, 2 inkpads"